Capsicum or bell pepper chutney recipe - Today I am going to share a very simple, easy and quick capsicum chutney recipe that can be prepared with few basic ingredients. 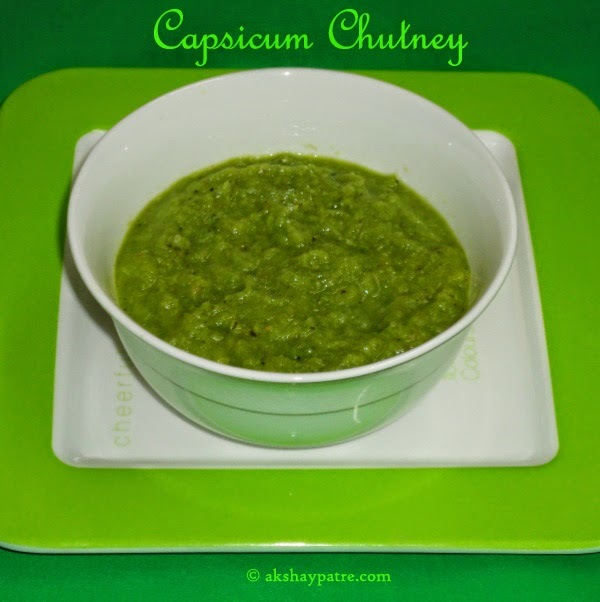 This capsicum chutney is a great accompaniment to dosas, idlis, theplas and parathas. Capsicums, green chilly, ginger and garlic are delicately roasted on stove flame and then blend them to a smooth paste to make the chutney. This chutney has mild smoky flavor. Whenever I make dosa, idli, parathas or theplas, I make chutney and capsicum chutney is one of them. To avoid extra oil in the chutney, I have not added tempering to it. You can add mustard seeds, broken red chillies and asafoetida tempering to this chutney. You can serve this capsicum chutney as a side dish to rice and curry. Even this chutney can be used to make bread sandwiches. I served it with the dal dosa that I had posted the recipe earlier. Wash the capsicums and pat to dry. Roast them on stove top till dark spot appears from all sides. Allow it to cool. Scrape out the dark spots with the back of a knife . Slit the capsicums and remove the seeds. Roast the ginger, garlic and green chilly, separately on stove flame until they turn to light brown and aromatic. Mix the capsicums, green chilly, ginger and gralic together and allow them to cool. Then grind them together through a mixer to a smooth paste using little bit of drinking water. Transfer to a bowl and add salt. Squeeze the lime in it. Now you can add tempering to it. Serve the capsicum chutney with dosa, idli, parathas and theplas. 1. Wash the capsicums and pat to dry. Roast them on stove top till dark spot appears from all sides. Allow it to cool. 2. Scrape out the dark spots with the back of a knife . 3. Slit the capsicums and remove the seeds. Roast the ginger, garlic and green chilly, separately on stove flame until they turn to light brown and aromatic. Mix the capsicums, green chilly, ginger and gralic together and allow them to cool. 4. Then grind them together through a mixer to a smooth paste using little bit of drinking water. Transfer to a bowl and add salt. Squeeze the lime in it. Now you can add tempering to it. Serve the capsicum chutney with dosa, idli, parathas and theplas. Never heard about this...... Looks tempting , will surely try out!! yummy, it tastes great! 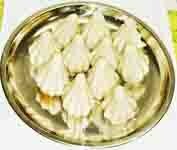 Nice accompaniment for idly / dosa. A new & colourful chutney..........love to try.thanks for sharing. Wow very flavourful green chutney, delicious.